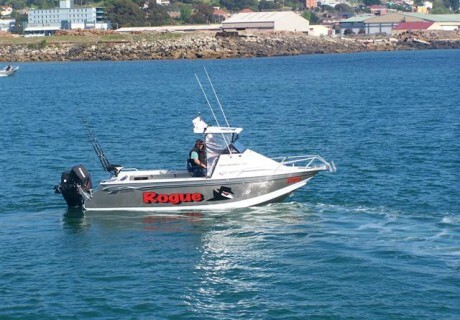 Recently two 20 year fishing mates decided to sell their small aluminium runabouts and purchase a boat that would satisfy their fishing needs for the future. With their two wives’ approval for the scheme a quest was started to find a suitable boat. The usual options were discussed and debated before the general requirements were agreed upon. The boat was to be around 6m in length, plate aluminium, powered by a four-stroke outboard and had to fit in a 9m long shed. Once the research was completed boat yards were visited in Queensland, Melbourne and home in Tassie. As expected both mates had slightly different ideas but once the Bar Crusher 680C (now 730C) was viewed at Coastal Marine in Somerset Tassie it was the end of that quest. Coastal Marine commenced a boat show weekend in the first week of June 2007 which saw both mates ‘tyre kicking’ and chatting to Peter Cleland from Bar Crusher. After discussing options a package was put together and the much-anticipated price was asked to be quoted. Anthony Wolfe from Coastal Marine provided a price that was extremely generous and the deal was made. The wives, as expected, had the final say on colour and the unseen Liquid Bronze was ordered, 10 weeks were quoted for the delivery date and six weeks later the package was delivered. Our first thoughts were wow what a sensational looking boat and we still get those comments from friends and spectators at the boat ramps. The boat has exceeded all our expectations, it is light to tow, extremely easy to launch and retrieve, absolutely flies with the 200hp four-stroke Suzuki. The most amazing feature we believe is its ability to cut through that terrible chop, that saw our other boats bouncing harshly, slowly and uncomfortably. The Bar Crusher 680C just cuts through it and allows for incredible speeds across it. Truly amazing. The 680C is a very versatile fishing vessel, tows the kids on skis and biscuits effortlessly and is just great fun to play with. We could not be more pleased. We recommend Bar Crusher to anyone.